Select the microphone, should be based on the use of the occasion and the sound quality requirements, combined with the characteristics of a variety of microphones, considering the selection. For example, high-quality recording and broadcasting, the main requirements of good sound quality, condenser microphone should be used, aluminum microphone or advanced moving coil microphone; for general amplification, the use of ordinary moving coil type can be; when the speaker moves from time to time Or talk with the megaphone distance greater, such as karaoke OK, should use unidirectional, low sensitivity microphone to reduce noise interference. The use of condenser microphone requires a phantom power supply. Generally, the supply voltage is indicated in the microphone's technical parameters. To select a phantom power supply of a suitable voltage, the mixer is equipped with a 48V phantom power supply. When using a microphone, the best match is the output impedance of the microphone and the input impedance of the amplifier. If the mismatch ratio is more than 3: 1, then the transmission will be affected. For example, the 50Ω microphone connected to the input impedance of 150Ω amplifier, although the output can increase nearly 7Db, but both high and low frequency sound will be a significant loss. The BOYA BY-SM80 is a stereo X/Y condenser microphone that delivers broadcast quality stereo sound to your DSLR camera, video camera, or audio recorder. 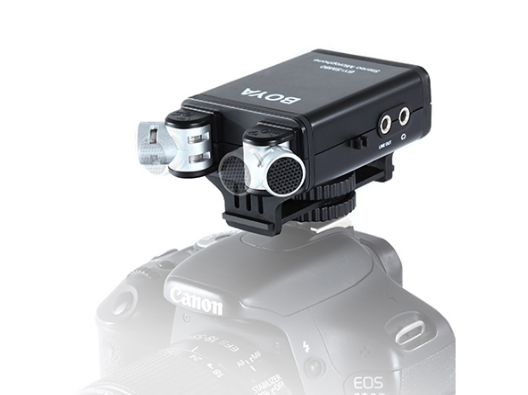 This microphone provides greater control of your audio than the internal mics on DSLR camera, video cameras, or digital recorders. Microphone output voltage is very low, in order to avoid loss and interference, the cable must be as short as possible, high-quality microphone should choose twisted pair metal shielded cable, the general microphone can be used single-core metal shielded cable. High-impedance microphone cable length should not exceed 5 meters, or treble will be a significant loss. Low impedance microphone connection can be extended to 30m-50m. Usually, the working distance between the microphone and the mouth is between 750px and 1000px. If the distance is too long, the echo will increase and the noise will increase relatively. If the working distance is too short, the signal will be distorted because the signal is too strong.